Looking for your next stunning Irish fieldhunter? Balin hilltopped 3x in MD in 2018 season before the winter weather shut most of us down in early January, he has done hound walking, and also schooled at local shows in NC/SC. He's been hacking out for years and is good in a group or alone. Fabulous flat hunter mover, but carries himself uphill and naturally goes in a frame. Very brave, and very good over fences. As is typical of Irish horses, he's very personable and intelligent. He has excellent feet (shoes only needed if terrain is rocky or hard) and clean legs with strong bone. He's a very easy keeper. While still a bit green, he has a willing attitude, athleticism, and natural rideability. Large enough for a tall gentleman, but easy enough to be ridden by a lady. He was vetted in November 2018 with a full set of clean radiographs. Looking for an Adult jumper packer? Eton was imported from Germany where he was competing in the 1.15m-1.20m jumpers. After importation, he showed in the 3' hunters in 2016, foxhunted two seasons, and competed in the 1.0-1.10m jumpers in 2017-2018, with plans to move up as his current rider's ability increases. He is VERY competitive in the ring with a keen desire to win, absolutely loves to jump, is scopey and brave, has lovely technique, and is highly rideable for an experienced, confident rider. Great conformation and very attractive, in addition to being lovely to have in the barn, and he gets along well with other horses. Scope for the Grand Prixs, but easy enough for a Ch/AA or Jr-A/O rider. Series Champion for the Ch/Adult class at Twilight Jumpers with a win at the July and July shows. 14 yr old, ~16hh, reg. KWPN-NA mare (Consul x TB). 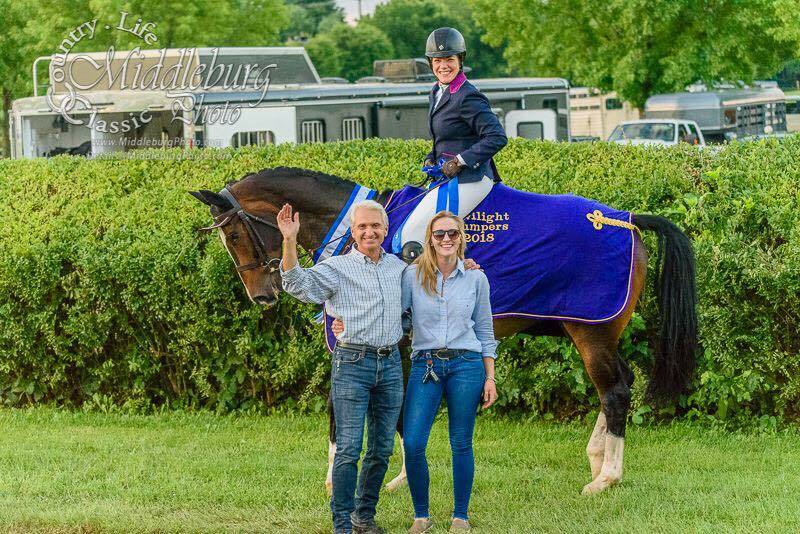 Zeda hunted 4 seasons first flight with Middleburg, Piedmont, and OCH before going to CA, and has now returned to VA. She is lovely over fences and a fabulous mover. Has been a guest horse out hunting. Has shown to 3', but lead changes aren't always 100%. Gorgeous in looks, movement, jump, and behavior. She is a better follower than leader. Height of jump is no issue! Fantastic with hounds and other horses. Only needs front shoes. We've owned or known her since she was 3, and she has not had any unsoundnesses or major vet issues. She does best with 8+ hours of daily turnout, and is quite happy to be out 24/7. She can go out in a mixed herd. She trailers beautifully, and is perfect on the ground and for farrier and vet. Hero (reg. "Hereosaurus Rex") is a talented hunter prospect for the regular and TB hunter divisions, or continue his fox hunting career. He is completely amateur proof! He has lovely form over fences, auto lead changes, is a lovely hunter mover, and also brave! He likes to go slow in the ring, but can pick up the pace when asked to do so. He is more forward in the hunt field. Goes side-saddle, and has x-c schooled. He is currently jumping courses to 2'9" at home. He hunted eleven times in the 2017-2018 season (1x first field & 10x in second field) with Piedmont Fox Hounds and Middleburg Hunt. For the 2018-2019 season he is going in the first field with Piedmont in the Tuesday & Saturday country, and first field with Snickersville Hounds. He goes in a rubber snaffle for everything, excellent manners, not spooky, very good at getting gates. No vices, sound, and clean legs except for an old, cold splint on his hind leg. His flat work is VERY good, very flexible and accepts contact, but he is still a bit green on jumping courses. However, he is easy enough to be finished by a junior or amateur with a trainer. He is the same in the ring whether ridden every day or every 10 days. The below videos were taken after 10 days without being ridden due to all of the rain and our ring being under water. Sully (reg. "Soul Approval") is a talented prospect for field and show hunters. He has lovely form over fences, super scope, lead changes, is a very good mover, and has even done some BN/N-level XC schooling -- he is VERY brave! Very quiet and slow - he just lopes everywhere. He jumps what you point him at, in great form. 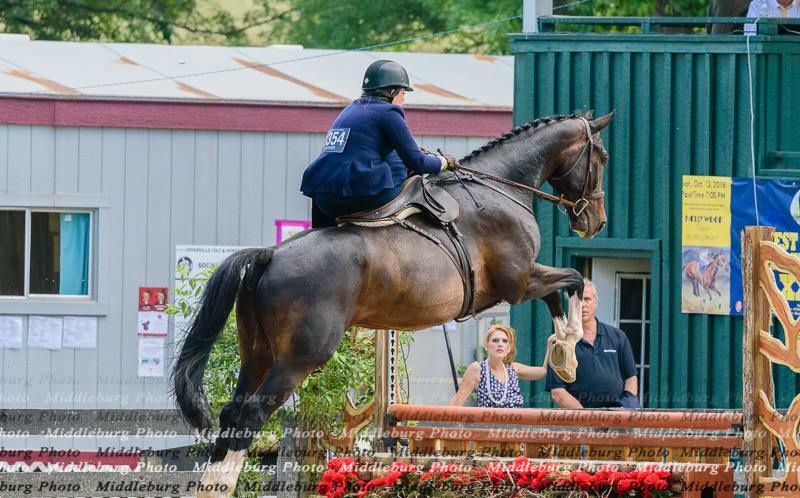 He is currently jumping courses to 2'9" in the ring, and hunted over twenty times in the 2017-2018 season with the Piedmont Fox Hounds and Middleburg Hunt, once in the first field and the rest in the hilltoppers/second field. He is hunting again with Piedmont this season and has been out in the first field three times. Even in his first season, he was consistently used as one of our guest horses for riders new to hunting -- he is that easy! He will trot or canter the biggest fences, never pulls, stops and slows down himself to maintain an even pace with the horse in front of him, is happy to lead the group or be towards the back, and stands at checks. He raced very briefly (and unsuccessfully) on the flat track, and then was put into steeplechase training, but bowed his RF tendon (mid) fall 2016 and his trainer decided not to try to race him (I think his major case of "the slows" also had something to do with it). Based upon his tendon ultrasounds, he is cleared for everything except upper level eventing. Sully is easy enough to be finished by a junior or amateur. We gave him a few months off after we got him in April to put on some weight, and then started his reschooling last summer. He is a mild cribber when he eats his grain or gets a treat. Gets along with everyone, is bottom of the pecking order, and goes out in a mixed herd. 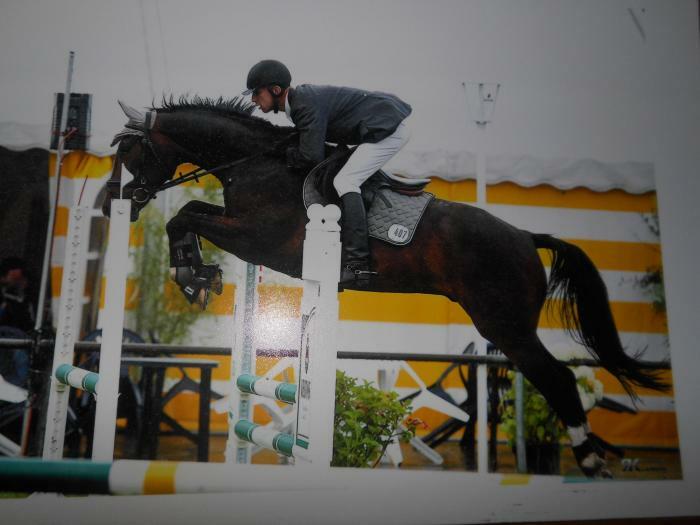 "Starstruck," 2012 16.2hh TB gelding (reg. as Soul Approval by Perfect Soul). Currently foxhunting first field with Piedmont Foxhounds, hunted last season with Piedmont and Middleburg, and he is now ready to start his hunter show career. 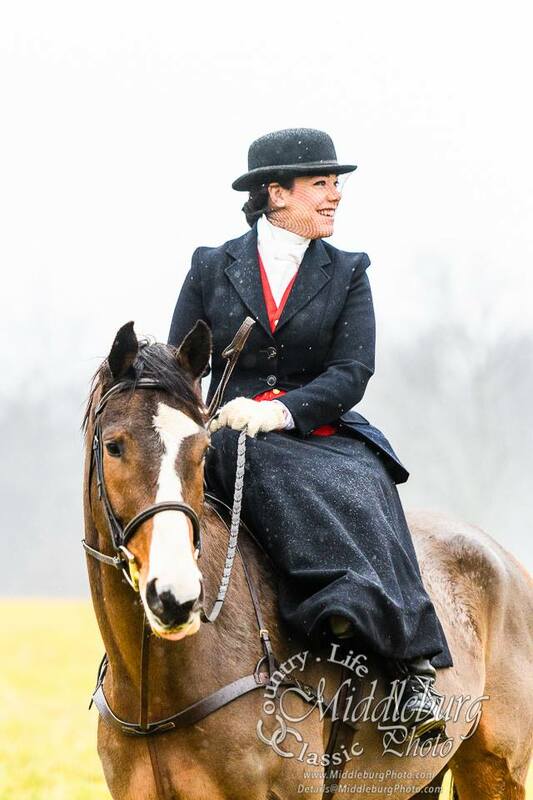 Very amateur friendly, a definite kick ride, goes astride or side saddle.